Since my previous February 14, 2017 update, Curiosity has worked its way through the dunes and has emerged, as planned at the head of what looks like a dry wash flowing down from Mount Sharp. At the time I had predicted that the science team would then have the rover make a beeline to Mount Sharp, following the smoothest route. That prediction is almost certainly wrong. Instead, the scientists are probably going to have the rover zig-zag its way south into the dry wash so that they can study the geology there. 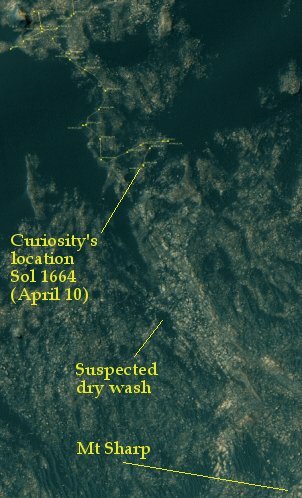 This is what they have been doing, as shown on the traverse map to the right, which shows Curiosity’s location through Sol 1664 (April 10). Ideally I expect them to want to check out the flow areas of the central parts of the wash as well as the contact point on either side where the color of the terrain changes from dark to light. This appears to be what they doing now, two weeks later, based on this update posted yesterday. The two materials, separated by what looked like bright-toned, sulfate vein material, caught the GEO team’s eye, leading us to plan multiple observations of these materials. The “Sorrento Harbor” target aimed to capture the transition from the Murray bedrock to the vein material, and the “Bean Point” target investigated a gray patch among the vein material. This gray patch resembled similar gray patches targeted over the last several weeks given their unique textures and chemistries. The AEGIS-targeted ChemCam raster, acquired post-drive on Sol 1673, ended up hitting the darker, smoother capping material, but GEO complemented it with a second target, “Cape Levi”, on another patch of this material in front of the rover. The image to the left, taken by Curiosity’s left navigation camera on sol 1673, shows the overall change in brightness at the contact between the wash and the darker areas around it. 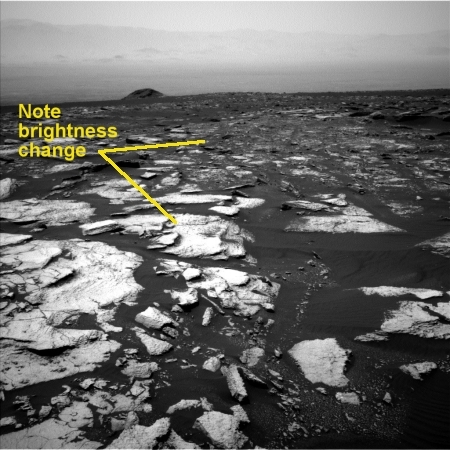 The image angle appears to look away from the mountain and out across Gale Crater. In the distance you can see the crater rim, with the vast flat plains of the crater floor in between. The atmosphere is hazy with dust, so that the distant rim is faint against the sky. Quite spectacular. Previously I had thought they would head into the canyon at the head of this wash. Without doubt that would be most exciting place to go, both in terms of science and sight-seeing. Realistically, this terrain, as breathtaking as it may be, might be too rough for Curiosity to traverse. If so, they will then I think head more to the southeast and up the smoother slopes of the mountain, visible in the image shown in my January 18, 2017 rover update. Since my February 14, 2017 update, Opportunity has made great progress heading south along the outside rim of Endeavour Crater. The rover has generally stayed as close to the rim as possible, keeping to the high ground (as shown by the panoramas in this March 8, 2017 post). 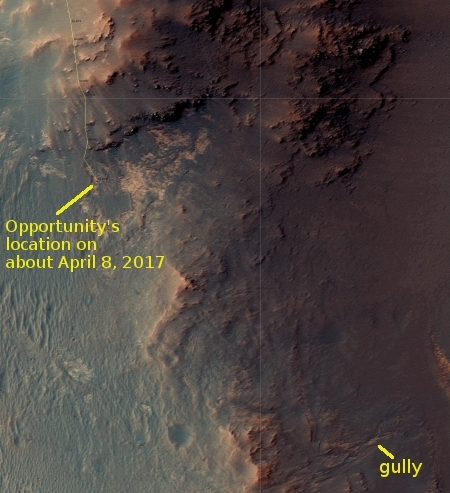 Two days ago the science team released a new color panorama, looking south, noting in the press release that the rover was finally leaving the rough more mountainous high regions of the rim that it has been exploring since 2014 and heading now into a lower area of the rim, dubbed Perseverance Valley, which contains the gully that might have been formed by flowing liquid and indicated in the image on the traverse map on the right. I have posted a reduced version of the color panorama below. If you click on it you can see the full resolution version. From my perspective, the terrain to the south doesn’t look that much different than the crest they have been traversing for the past two months. It also does not appear to be much lower in elevation. Nonetheless, the traverse image shows that it is generally smoother and will afford the rover a path downhill to the gully. From there, after they have thoroughly explored the gully and the geology around it, I think they might then decide to finally head out into the floor of Endeavour Crater itself. One last note: Today the Mars Reconnaissance Orbiter team released a very cool image showing Opportunity’s landing platform, still sitting in the center of Eagle Crater, where the rover landed thirteen years ago in 2004. At that time everyone was thrilled the rover had landed in the center of that little crater, since it would give the rover a golden opportunity (no pun intended) to study the geology revealed by the impact. No one ever dreamed it would someday have the chance to study the geology of a crater a thousand times larger. Very cool, thanks for these updates.